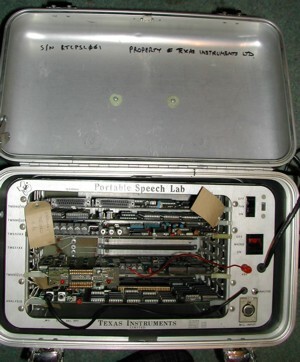 Earlier Portable Version (PASS) - "Suitcase with a memory for words"
The Texas Instruments Portable Speech Lab system, also known as PASS – Portable Analysis and Synthesis System, translates speech into pitch-excited linear predictive codes (LPC) in real time. 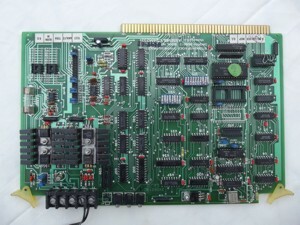 The system enables editing of the LPC data, immediate playback of recorded speech for instantaneous review of the sound it will have in the final product, and provides rapid storage of digitised speech into EPROM or uploading to a computer over an RS-232 interface. The system is self-contained in a portable metal carrying case, and is compatible with TI’s TMS 5100, TMS 5110, TMS 5200 and TMS 5220 LPC speech synthesis chips. 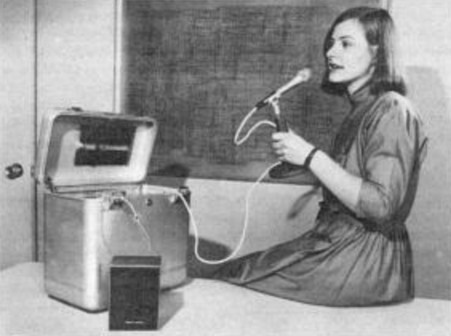 The system was also available later repackaged into a desktop case and marketed as the "SDS50 Speech Development System". LPC is a compression technique that models the human vocal tract, and is described in many of the documents referenced here. The system converts speech to LPC by first converting the signal from analogue to digital then using digital signal processing techniques. The resulting LPC data is then coded to further reduce the bit-rate in accordance with the coding tables stored in ROM in the selected target speech synthesis device. An example of the audio quality that can be achieved by the system can be played here (ignore the clicks and buzzes between the phrases; the audio was captured rather crudely using the Windows Sound Recorder). The two systems I acquired were used by a company that recorded station names for the British Rail automated announcement system, and these station names from the London area and South West England were found on an EPROM that was rattling around loose in the bottom of one of the cases. 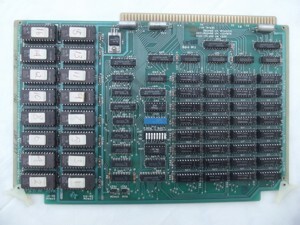 The system consists of five modules/boards of the TM 990 type. 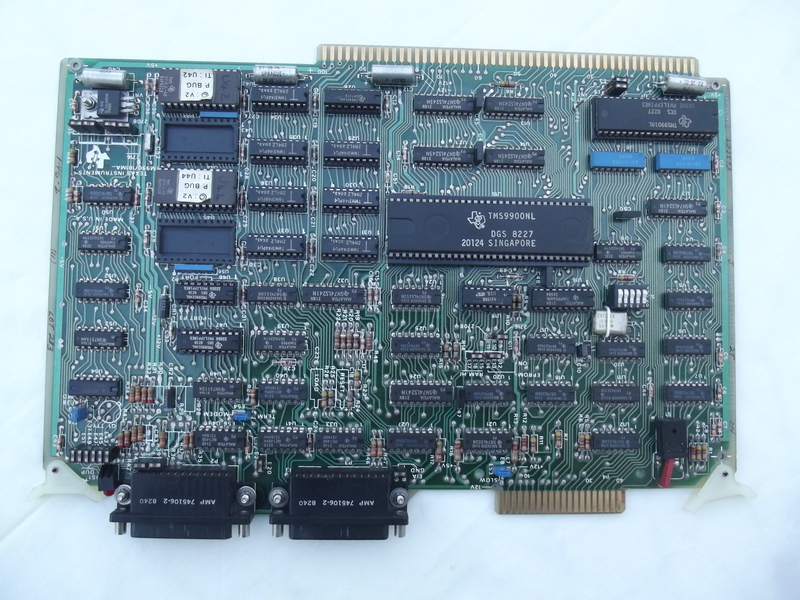 The components are a CPU module using a TMS 9900 processor, a memory expansion module to hold up to twelve seconds of speech parameters in RAM and program code in EPROM, a speech synthesis module for audio output, an EPROM programmer module and a real-time speech processor module. All the modules are standard TM 990 parts except for the speech processor, which was custom designed for this system. The modules are fitted in a card cage which, along with a mains power supply and cooling fan, are securely installed in a portable metal carrying case. The cooling fan has a separate on/off switch on the front panel to enable it to be temporarily switched off to reduce acoustic noise during a recording session. CAUTION! The following information is largely derived from experimentation with the system and from various documentary sources. Be aware that it may contain errors. Philip, for finding the systems for sale originally and for locating various documents relating to the systems. 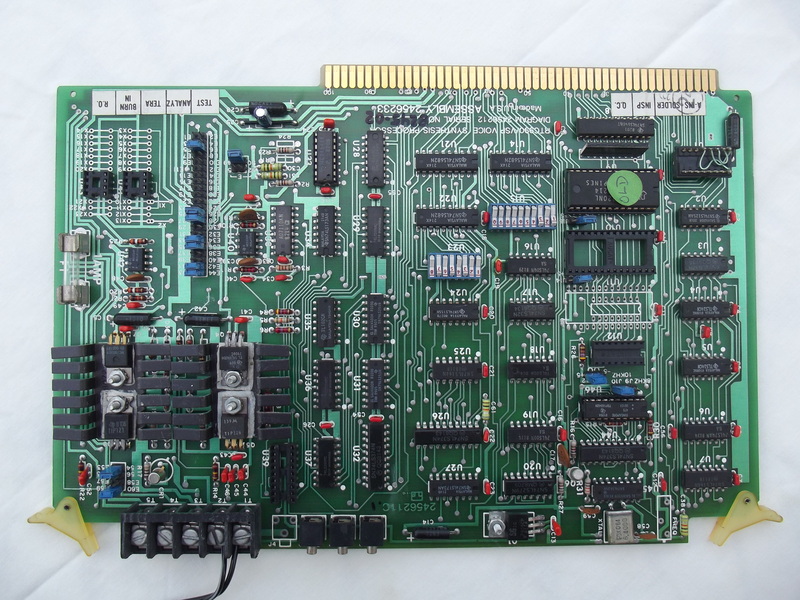 Harald, for disassembling some of the TMS 9900 software in the system. Steve Petersen (who designed much of the PASS system and co-wrote the magazine article reproduced here), who got in contact and was good enough to provide some more information and answer some questions. Read more from Steve here. 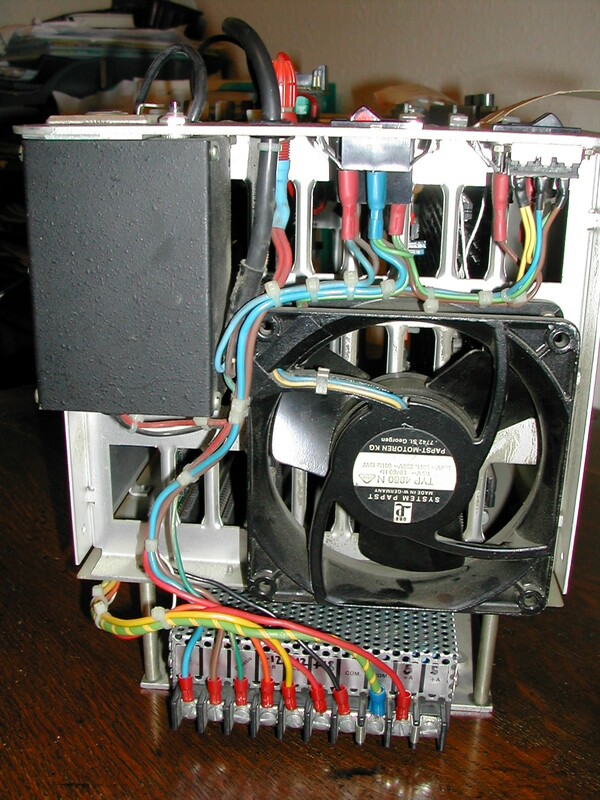 Note: The cooling fan has a separate 115/230V supply selection switch on the front panel. 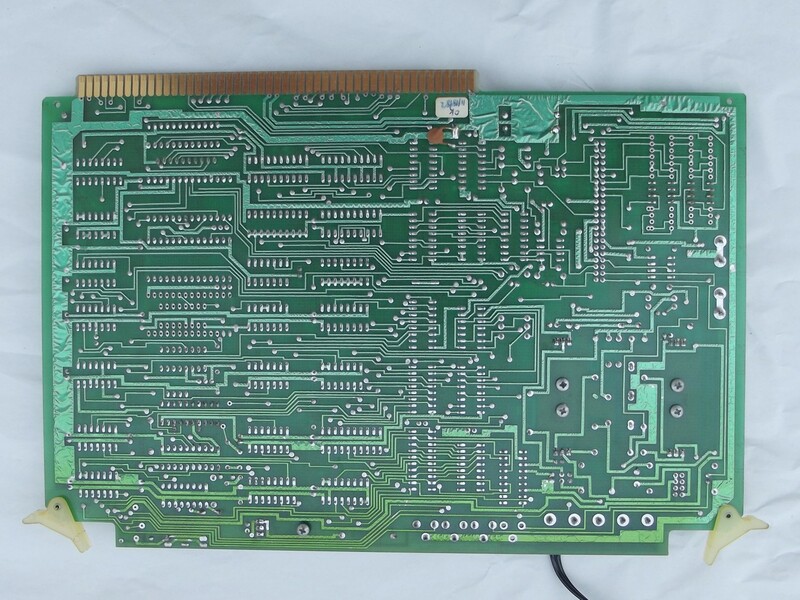 Note:	TMS 2532A (with an "A") EPROMs do NOT work – they have a lower programming voltage than the TMS 2532 devices (21V as opposed to 25V) and will not program correctly (and may be damaged). Connect an RS-232 terminal to port P2 (the left-hand RS-232 port) on the TM 990/101 module. Set the terminal to 9600 Baud, 7-bit data, even parity, 2 stop bits, no flow control. Note:	The Baud rate for port P2 is set by the ID switches on the TM 990/101 module. If speech data is to be upload/downloaded between the system and a terminal or computer, connect the terminal or computer to port P3 (the right-hand RS-232 port) on the TM 990/101 module. Set the terminal/computer to 7-bit data, even parity, 2 stop bits, no flow control; the Baud rate is specified at the time of upload/download. Connect the microphone to the XLR connector on the front panel. Connect the speaker to terminal blocks T1 and T2 on the TMS 52XX module. Ensure switches 6 – 8 of the edge-mounted DIP switch on the Speech Analysis module are set according to the speech synthesiser chip type to be used. Terminal mode, where a control terminal is connected and the system responds to commands entered by the operator. The remainder of this document relates to terminal mode unless stated otherwise. Check that the mains voltage selection switch on the front panel is set to the local mains voltage. Set the Fan switch on the front panel to ON. Note:	The speech chip type shown ("52XX"/"5220" in the above example) depends on the setting of the edge-mounted DIP switch on the Speech Analysis module. Power-off the system by setting the Mains switch on the front panel to OFF. All speech data that has not been download or written to EPROM will be lost. The system supports UPPER-CASE input only. It is not necessary to press <Return> after entering a command. To see a list of the commands supported, enter any character that is not a valid command at the command prompt (so enter ? for example), and answer Y to the HELP? (Y/N) prompt. If no phrase is currently stored, the system gives a short beep. Records a new phrase and processes it into LPC data. After entering the command, recording starts when the Analyse button on the front panel is pressed, and stops either when the button is released or the maximum recording time of approximately 12 seconds is reached. If a phrase was successfully recorded, the recorded phrase is then repeated. If a phrase was not successfully recorded (microphone too close or too far away), a short beep is given. After the command has been entered, but before pressing the Analyse button, pressing the RPT button on the Speech Analysis module repeats the last phrase. The RPT button appears to be inactive at all other times. The (A)nalyse command doesn’t work if chip type set to 51xx on DIP switch on Speech Analysis module and the unit is fitted with a 52XX board. The system just hangs. Sets the start and end frames within the current phrase over which other operations are performed. Display a confirmation prompt and returns to the TIBUG monitor. When the system is fitted with a TMS 52XX module, sets the playback volume level. The default volume level is about >9. A lower value is louder, a higher value quieter. This command does not affect the LPC data output. It controls an amplifier on the TMS 52XX module, not the TMS 52XX chip itself. Programs an EPROM using the TM 990/302 module. The command actually seems to support reading the contents of an EPROM and verifying an EPROM against memory as well. Not sure what the concept of a 'codepack' is as mentioned in one of the options. Enables a phrase to be concatenated with other words or phrases so that it can be heard in context using the (H)ear Concatenation command. Not sure how concatenations are set up. A hex value can be entered for each address, delay and SRC/INC field, with the space bar being used to progress through the fields. Press Q to quit back to the command prompt. SOURCE : 00=PACKED PHRASE, 01=302 EPROM, 11=MAIN MEMORY. Presumably plays a concatenated phrase. Lists the LPC data frames for the current phrase. Details of the parameters presented are given here. The "T-->" and "B-->" lines are the top and bottom frame markers associated with the (B)oundary Set command. Presents a series of sub-commands for editing the current phrase. C: speaks the next two frames and steps to the next frame. G: inserts a copy of the current frame. I: speaks the frame slowly and steps to the next frame. Q: speaks the phrase and returns to the command prompt. (Minus): steps to the previous frame. < and >: ignore changes to the frame and display the frame again. <Esc>1..9: speaks the phrase at varying speed, with <Esc>1 being normal speed, and <Esc>9 very slow speed. <Return> steps to the next frame. The columns of data are the same as those used with the (L)ist Phrase command. Typing in new numeric values steps from field to field and then steps to the next frame. Pressing <Space> also steps from field to field, retaining the current value of each field. If an invalid 'K' parameter value is entered, the display steps down a line for entry of a valid value. Not sure what the relevance of converting the data to serial, and the bit position is. Outputs data to a remote computer connected to port P3 on the TM 990/101 module. The data is output in relocatable 990 tagged object code format. Not sure what the definition of a codepack is - a data block containing multiple phrases? Not sure of the difference between outputting to Computer or Terminal in the first option. Nothing is output if an IDT of just <Space> is specified. Note typo in first option! Presumably downloads and speaks a codepack from a remote computer connected to port P3 on the TM 990/101 module. Not sure what the definition of a codepack is. Speaks the phrase at varying speed, with 1 being normal speed, and 9 very slow speed. PRESS ANY KEY TO STOP. The checksum varies between the two systems I have tested. Mine gives a checksum of 8F09. The LO and HI values displayed relate to the audio input and may be different to the values shown above. If you press and hold the Analyse button on the front panel and speak into the microphone, these values change. The values LO and HI are read from >E000 to >E006 and >E400 to >E406. The last three bits of the value relate to the setting of switches 8, 7 and 6 on the DIP switch on the edge of the Speech Analysis module. The 4th from last bit shows the state of the RPT button on the Speech Analysis module: 1 = pressed. The 5th from last bit shows the state of the Analyse button on the Speech Analysis module: 0 = pressed. The 6th from last bit is derived from the frame clock and toggles between 0 and 1 at approximately 1 second intervals. Retrieves packed phrase data from an EPROM. whether to scan the EPROM for phrase data but not load it into memory, or whether to scan and load the phrase data. On loading a phrase, the system displays the phrase information, speaks the phrase, then displays the QUIT? (Y/N) prompt. If just scanning for phrase data, the phrase information is displayed followed by the QUIT? (Y/N) prompt. Answering Y to the QUIT? prompt returns to the command prompt. This section is a 'reprint' from an article about the system that appeared in the magazine "Electronics" dated September 8, 1982. Long a science writer’s fantasy, talking machines have recently become feasible in consumer products and are appearing increasingly in business and industrial applications, thanks largely to compression techniques such as linear predictive coding, which models the human vocal tract. Yet although the sound of synthesised speech has improved markedly since its introduction – at least for a given amount of storage space – the process of converting speech into linear predictive codes has remained laborious. A major drawback of LPC and similar speech-encoding systems has been the delay between the original recording of a speech sample – usually on magnetic tape – and its subsequent digitisation and replay. By the time the speech sample has been encoded and tested with the target synthesiser – the speech synthesiser that will be used in the final product – the original speaker is often not available should it prove necessary to retape the sample. PASS, a new portable analysis and synthesis system, replaces cumbersome encoding techniques by translating speech into linear predictive codes in real time. Not only does PASS allow immediate playback of encoded speech for instantaneous review of the sound it will have in the final product, but it can also provide rapid storage of digitised speech into erasable programmable read-only memory. 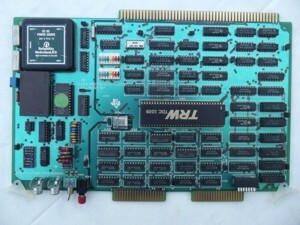 Compatible with the TMS 5100, 5110, 5200 and 5220, which compose Texas Instruments’ present line of LPC speech-synthesis chips, PASS can reduce to minutes the time required to prepare encoded speech for ROMs and EPROMs. It also allows companies to keep their speech development in house, where they can be assured of confidentiality, and may even encourage the formation of independent speech-development laboratories. What’s more, the system's portability means the hardware can be shared by different development teams within an organisation, and its operation is simple enough to enable even an unsophisticated user to encode and replay speech. The basic stand-alone configuration for PASS (Figure 1) comprises a microphone, a loudspeaker, and the PASS unit itself. Such a system is capable of demonstrating speech encoding and playback through the target synthesiser. The encoded speech can be played back through the synthesiser at the push of a button. However, for saving encoded speech and editing the LPC parameters, a terminal must be added to the basic system so that operations can be performed under control of keyboard commands. The terminal is attached by means of an RS-232-C interface and enables the operator to list and edit the LPC parameters for pitch, reflection coefficients, and energy. Commands can be given for downloading the encoded speech into an EPROM chip by means of an optional built-in EPROM programmer. This method allows quick, efficient generation of vocabularies that can be used directly in a product or evaluated in a prototype system. The PASS system can also be interfaced with a host computer that controls a speech data base. The data base can serve as an archive for encoded vocabularies; whenever words or phrases that have already been encoded are needed for another project, they can be retrieved easily, combined or edited, auditioned, and downloaded to EPROMs, all with the PASS unit. As shown in Figure 1, the flow of data is from the microphone input to the custom processor board, where the analogue signals are converted into digital autocorrelation coefficients, which reflect the degree of periodicity of the waveform being analysed. The custom processor board stores these coefficients on the memory board in 25-millisecond segments, or frames. While the custom processor board is dealing with a frame of speech, the CPU on the TM990/101MA processor board takes the coefficients stored in memory from the previous frame and transforms them into parameters that can be employed to control the speech synthesiser. These parameters may be activated through the synthesiser to create speech directly or downloaded into EPROM. where s(n) is the nth digital speech sample and M is 200, the number of speech samples in the frame. In order to obtain two sets of coefficients, the analogue input is first divided between two different filter paths, as is illustrated in Figure 2. The first set of autocorrelation coefficients, that for LPC spectral analysis, is derived by first passing the speech input signal through a Hamming-window circuit. The Hamming-window circuit is a multiplying digital-to-analogue converter that imposes a cosine-bell envelope on the 25-ms frame of speech to attenuate the signal at either end of the frame. Thus the end points of each frame are kept low in amplitude to smooth the contours of the synthesised speech waveform. The output of the Hamming-window circuit is then sent through a low-pass, 4-kilohertz filter in order to remove any high-frequency noise, including aliasing (that is, spurious signals generated by sampling). The spectral information that is necessary to reproduce human speech is contained within this 4-kHz band. At the same time, the original input is sent through another low-pass filter with an 800-hertz cutoff frequency. The output of this path is used to create the other set of autocorrelation coefficients, those employed for tracking the pitch of the input speech. The outputs of both filters are sent to the data selector, a multiplexer that feeds them alternately to a hybrid 12-bit linear analogue-to-digital converter. This converter samples each of the signals at an 8-kHz rate by successive approximation. The output of the a-d converter – 96 kilobits per second for each signal – is sent to another data selector which stored the digitised data in one of two high-speed random-access memories. The data selector also multiplexes the digitised data, switching between the two memories every 25 ms to create the frames. Thus the memories act as two separate buffers, each storing a 25-ms frame of speech. While one buffer is being loaded, the contents of the other are taken by a third data selector and fed to a high-speed multiplier-accumulator, where they are translated into autocorrelation coefficients under the control of the index-generation logic. This process results in the calculation of 140 autocorrelation terms for each frame of speech: 12 coefficients are created for the subsequent LPC spectral analysis, and 128 are computed from the 800-Hz band for use in the pitch analysis. 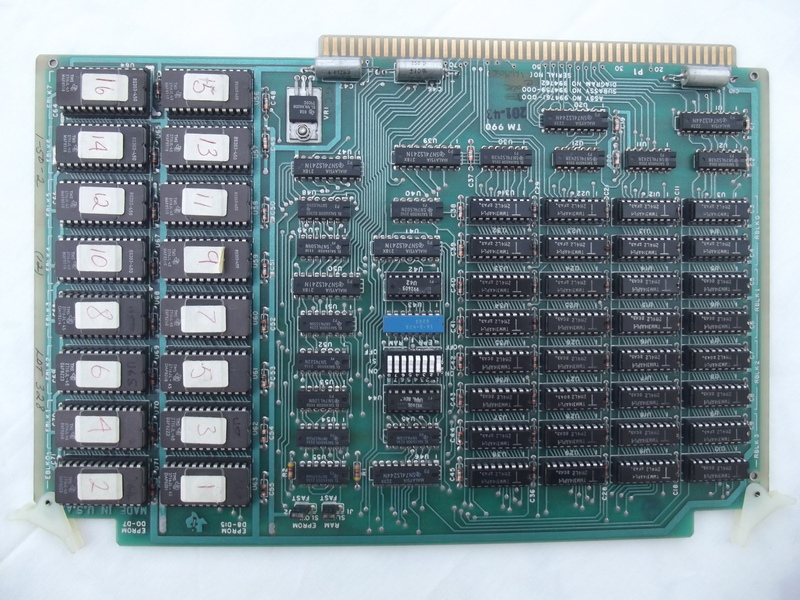 These coefficients are transferred by direct memory access to the system’s main store, the 201-43 memory board. As data is being sent to one buffer of the main store, the CPU takes stored information from the alternate buffer. In effect, the CPU works in opposite cycles to the customer processor. The CPU, programmed in assembly language to perform in real time, goes through four functional computations to produce the parameters needed by the synthesiser (Figure 3). In its first computation, the CPU takes the set of 128 coefficients and performs an autocorrelation pitch analysis to obtain one pitch parameter for each frame. This parameter is used by the synthesiser to determine whether the synthesiser filter should be excited by white noise which produces an unvoiced sound – which in humans does not involve the vocal cords – such as "h", "s", "f", or by a periodic excitation, which results in a voiced sound such as the "ee" in "speech". For voiced sounds, the fundamental frequency is also calculated in the pitch analysis, determining the pitch of the synthesised sound. A second software routine determines the reflection coefficients that will shape the synthesiser’s lattice filter, which models the vocal tract through which the voiced or unvoiced excitation passes. This routine uses the spectral set of 12 autocorrelation coefficients computed by the custom processor board to produce 10 reflection coefficients. The algorithm used by the processor is based on the work of two French mathematicians, J. Le Roux and C. Guéguen of the Ecole Nationale Supérieure de Télécommunications in Paris. 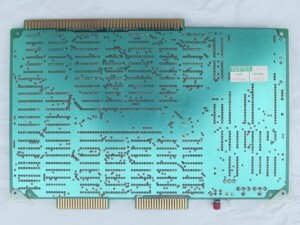 The Le Roux-Guéguen algorithm is what makes it possible to use a general-purpose processor like the TMS9900 CPU to do the needed calculations. With earlier algorithms such as the Levinson recursion or direct-matrix-inversion techniques, floating-point calculations are required to handle the wide range of intermediate values that can result during the computations. The advantage of the Le Roux-Guéguen algorithm is that it yields intermediate values with magnitudes less than 1, thus permitting fixed-point calculations to arrive at the same reflection coefficients. The third computation performed by the CPU is a calculation of the energy of the input signal. This calculation is used to determine the gain needed by the synthesiser to reproduce a sound with the same volume as the original speech. Once this routine is completed, the three parameters needed to drive the synthesiser – pitch, reflection coefficients, and energy level – have been determined. All three of these routines are performed in real time as the speech signal is being input by the speaker. The speech parameters that are produced require less than 7 kb of memory per second for storage, as compared with 64 to 96 kb/s for direct waveform encoding. 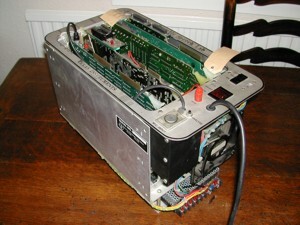 As a result, the LPC compression techniques substantially reduce the amount of memory required to store the digitised speech and make possible a portable system that uses only RAM storage. The maximum phrase length that the PASS can accommodate is 12 seconds. That limit is set by the 16-k bytes of RAM available. A fourth routine goes through all of the stored intermediate parameters frame by frame and encodes them to correspond with the decoding table that is stored on the synthesiser chip. Once this is done, the parameters can be formed into a bit stream and sent to the synthesiser. After the encoded speech has been readied for the synthesiser, it requires approximately 1.8 kb of memory per second of speech. This represents a 50-to-1 reduction in storage space over the directly digitised waveform. In many cases, the user will find it possible to employ the PASS system primarily for speech capture without needing to edit the captured speech, since the facility of intermediate playback through the processor makes it simple to record a word or phrase again if it is not satisfactory the first time. However, the commands available when the PASS system is attached to a terminal allow EPROM programming and sophisticated speech-editing functions, including the ability to create any new sounds that are theoretically possible for the human vocal tract. The commands available in the command menu are shown in Table 1. For example, striking P on the terminal keyboard calls up a menu of commands for EPROM programming. Pressing A – for analysing another phrase – readies the PASS system to record a new phrase. Once the phrase is captured, it can be played immediately by striking the R key in order to invoke the replay phase command. The next likely step when editing would be to employ the commands for listing or editing phrase parameters. When either command is invoked, the LPC parameters are displayed on the screen, as shown in Figure 4. The energy parameter (ERGY) is listed after the frame number, followed by the gain parameter (CE), the pitch parameter (P), and the reflection coefficients, K1 through K10. Figure 4 LPC Parameters for the Word "Help"
For a novice, the parameters that are simplest to edit are energy and pitch. If some syllable or sound should receive more emphasis, the energy value can be suitably increased. Pitch can be altered similarly. The more sophisticated user can edit the reflection coefficients, which may be used not only to edit recorded speech but to create sound effects. By employing the hear-concatenation sequence command, the user can play an edited phrase in context with other words or phrases. If, for example, the word "two" is to be used to tell time – such as "one thirty-two" or "two thirty-one" – its inflection will differ according to its position in the phrase. The modify-concatenation sequence command permits the user to specify the order of phrases, which can then be evaluated by means of the hear command. Links to specifications and documentation for many of the modules are available here. The DIP switches on the TM 990/101 module control the system operating mode and port P2 Baud rate as detailed in the following table. Switch set to ON reads as 0. Switch set to OFF reads as 1. Note:	On my system the DIP switches are a little "sticky" and often require a bit of fiddling to make them register the correct position. PROMs – "991605 U42" and "991606 U44 REV. *"
Jumpers J1 and J2 both set to FAST. DIP switch – position 1 OFF, 2-8 ON (RAM at >B000 - >EFFF, EPROM at >2000 - >9FFF). +/-8V regulator outputs fed to Vaux and Vbatt lines on backplane. Supplies for the Speech Analysis module. Speaker output on screw terminal blocks T2(-) and T1(+). Speaker may buzz at power on until the processor module is reset. J3 gives audio line output. 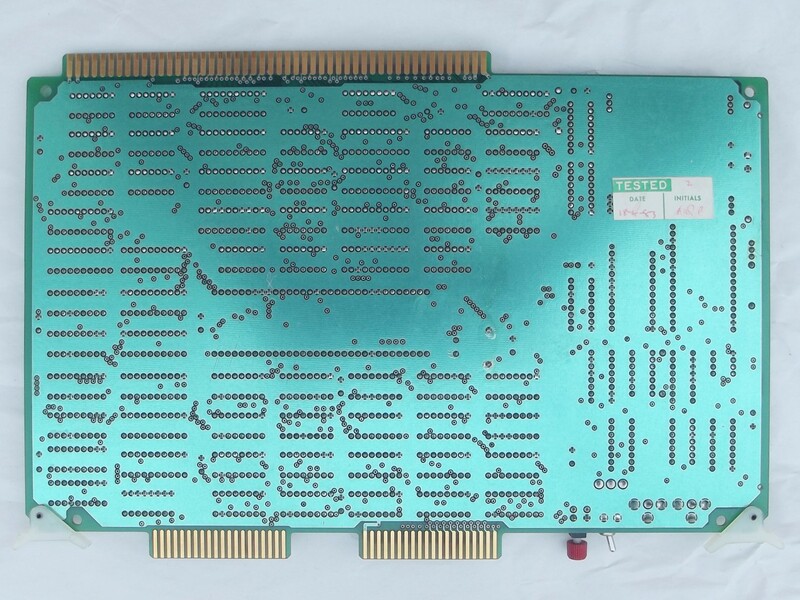 U10, U11 and U12 appear to be sockets for fitting TMS 6100 (28-pin 0.6" footprint) and TMS 6125 (16-pin 0.3" footprint) voice synthesis memories. A jumper adjacent to each socket is used to hard-wire the /CS pin for that socket either permanently enabled or permanently disabled. U15: 10 MSbits of the TMS 5220 memory address decoding, with switch position 1 being the MSbit and switch position 0 being the LSbit. With switch positions 1 and 3 OFF and the rest ON, this gives the memory address of binary 1010 0000 00xx xxxx or >A000. U23: Module CRU software address decoding, with switch position 1 equating to address line A3, and switch position 7 equating to address line A9. Switch position 8 is not connected. With switch positions 3, 5 and 7 OFF and the rest on, this gives the CRU software base address of binary (000)0 0101 010x xxxx or >0540. J9 (8 kHz/10 kHz): Sets the playback sample rate of the speech synthesiser chip. Changing the jumper while powered-on sometimes seems to require a power-cycle or the system hangs. IT DOES NOT SET THE RECORDING SAMPLE RATE, WHICH SEEMS TO BE STUBBORNLY FIXED AT 10 KHz. J11/12, J13/14, J15/J16 (-5V/+5V): Hard-wire the /CS inputs to voice synthesis memory sockets U12, U11 and U10 respectively. When set to the -5V position, /CS is active. E41/42, E43/44: no speaker output with these jumpers removed. E33/34, E35/36: no speaker output with these jumpers removed. E53/54, E59/60: some sort of output filter? Speech not as good with this jumper removed. E5/6: no speaker output with this jumper removed. This is a standard TM 990/302 module with a TM 990/515 EPROM Programming Personality module for programming 2508, 2516 and 2532 EPROMs. 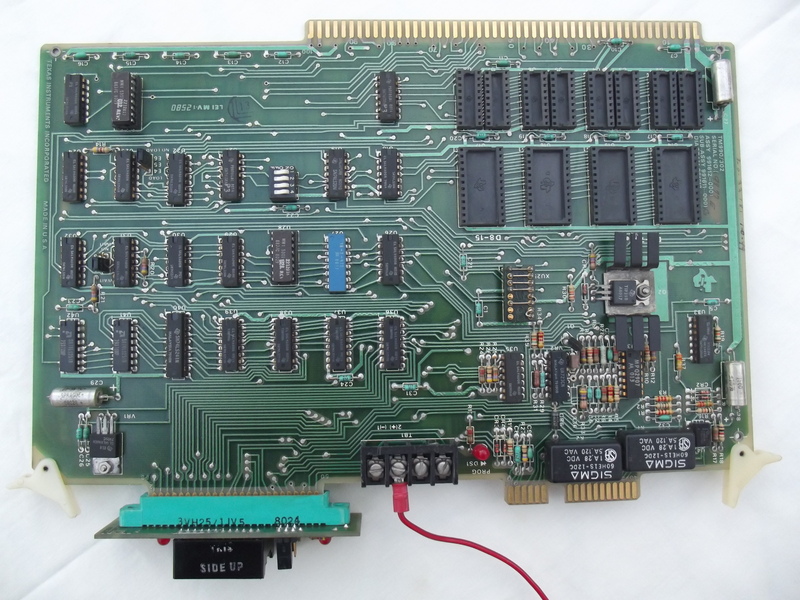 No on-board RAM or EPROM memory expansion is fitted. The module has a flying lead to the EPROM programming supply connector on the front panel. SW1 – SW4: all OFF. CRU bit 5 is the 20 or 25ms frame clock. SW1 (nearest PCB edge connector) and SW2: appear to be CRU base address, with SW2 position 1 being the MSbit and SW1 position 8 being the LSbit. With all switches ON except for SW2 position 4, this gives the default CRU base address of binary 0001 0000 0000 0000 or >1000. Switches 6 – 8 of the edge-mounted DIP switch specify the target speech synthesiser chip type. The switch settings are shown on the adjacent printing on the chassis front panel ('1' = switch ON) and are reproduced below. The card cage is an 8 slot version. The backplane is a late version with ‘power present’ LED indicators. The system contains a modified version of the TIBUG monitor in EPROM. TIBUG is described on this page. The TIBUG monitor in the PASS system contains an additional command, 'G', which is a 990 tag format loader which recognises the standard tags with the exception of the 'B' tag which seems to load data byte-by-byte instead of word-by-word. The system contains a basic self-test routine in EPROM at address >09B0. This has to be run from the TIBUG monitor using the 'R' command to specify the start address then the 'E' command to execute the routine. The output of a successful test is shown below. I was excited to receive an e-mail from Steve Petersen who designed much of the PASS system and co-wrote the magazine article reproduced here. Steve came across this web page and described the system as "one of the most fantastically interesting projects I ever designed/built during my career". Various photos: (1) an early PASS unit, (2) a Speech Analysis module laid out on a prototype wire wrap board, (3, 4 and 5) Steve using a PASS system. TI Dallas site internal newsletter article announcement of the PASS system. TI press release for the SDS50 system. This comprises the components from the PASS system repackaged into a desktop case (this work was possibly done by TI Bedford in the UK). 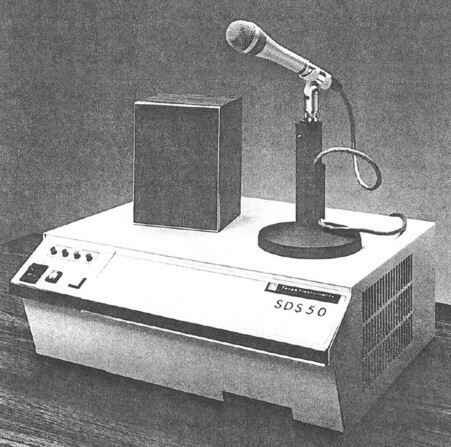 Brochure for the SDS50 Speech Development System. Some of the papers you supplied show or refer to the system as the "SDS50". Is that exactly the same as the PASS system, but in a 'desktop' housing? Yes. So the PASS in its briefcase was the portable version, and the SDS50 not so? Yes, but PASS came first, and was what I developed. Were both systems available at the same time? No, PASS was first. How did you get to the EPROM programming socket with the SDS50? Beats me. Googling "SDS50" has also brought up some interesting results! Yea, I don't know a lot about the SDS50, since it was developed after the PASS. But I believe it was basically just taking the PASS parts and putting them in a standard desktop enclosure. I think the guys in the UK might have done that. The sampling rate. I'll be surprised if you remember this but I'll ask anyway: the system supported a sampling rate of 8 or 10 kHz. There's a jumper on the TMS52xx module that sets the playback sample rate for the speech synth chip, but I haven't been able to find a way to set the recording sample rate - no labelled jumpers and no option in the software. Do you by any chance recall how to set it? My only thoughts are it required a different software version, or it's an unlabelled switch or required a different PROM on the Speech Analysis module - but none of those possibilities make it very user-friendly to switch the frequency. I'm not positive, but I think the sampling/analysis rate was pretty much fixed in the Speech Analysis module. At least I'm pretty sure. I don't recall me developing two versions of software or having any way of changing it. I do think there were two rates that the LPC chips operated at. Maybe the DSP based Speech Analysis module you mention (below) could do both. One of your papers says that PASS was developed by the CEC - Corporate Engineering Centre. What other sorts of things did they work on? Yes, it was the Dallas CEC where I worked. The CEC was basically the interface between R&D and the operating groups. The CEC would take basic research/development and try to find ways for the TI operating groups to make products/money, so you can use your imagination. A lot of very cool stuff going on there. I also worked on some optical character recognition stuff in the CEC that was patented. You'll see Dr Helms name on that patent also. What was your history of working for TI up to that time? Had you moved around between different divisions/groups? I was pretty young then. Graduated from Central Michigan University with a Bachelors of Individualized Studies in Electronic Sound Synthesis. Not much luck finding employment with that degree, so accepted a position as a Technical Writer at Texas Instruments Lewisville (just outside of Dallas). Worked as a technical writer on military image processing equipment for one year (the minimum allowed) and got myself transferred to the CEC. Initially worked on some minicomputer based software for editing databases LPC speech data, and then got involved in the PASS. They had been trying for some time to come up with something similar, but the approach they were taking was too complicated and too awkward. They wanted me to try and get what they had working, but I basically told them that I needed to start over from scratch. I found a TRW multiplier-accumulator chip that did most of the needed fast calculations for the required autocorrelation coefficients. This was just pre-TI DSP chip availability, so there was a ton of TTL logic. You've seen the board. :>) Using the multiplier accumulator, I designed a dual RAM buffer front end that collected the digitized audio and all of the other needed functions. Other than using the TI ROM monitor, I believe I wrote all of the PASS software in assembly language. Were you involved in any other aspects of LPC speech? Initially worked on some minicomputer based software for editing databases LPC speech data at the CEC. A guy by the name of Ken Stevenson helped me with that. Ken became a very good friend of mine. How many people worked on PASS? Myself and a technician, Butch Dodd did almost all of the implementation of the custom circuitry. Butch was a big 'ol Texas guy that just cranked out the electronic technician and assembly work. He helped do a lot of the assembly of the first PASS systems. The algorithms for converting autocorrelation coefficients to LPC data and a few other complex software areas were explained to me by Dr Gene Helms. I could not have done it without Dr. Helms. What sort of development/testing tools and systems did you have available? I recall a lot of wire wrap. A lot of assembly language. A lot of hand drawn schematics. Not much in the way of any tools more complicated than a multichannel scope. Don't even think I had a logic analyser. Ah, and a big set of the yellow/orange TI TTL data books were indispensable. 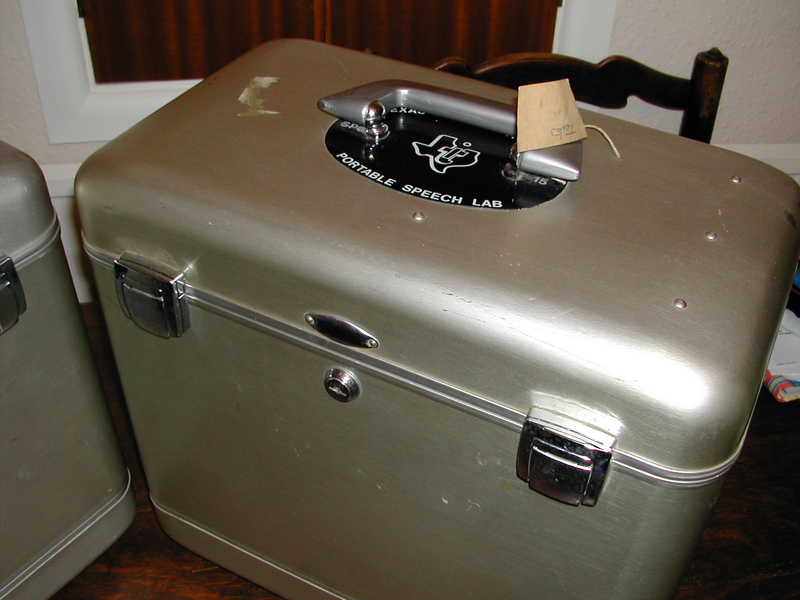 It looks like the only bespoke hardware developed for PASS was the Speech Analysis module, and fitting it all into the 'suitcase'. Did designing the Speech Analysis module offer any specific difficulties? This was the key to the whole deal. Yes! (see above). Were different people allocated to hardware and software, or did people work across all areas? The "people" were me for the hardware and the software. Algorithm definition by Dr. Helms. How long did the PASS development take? [One of your papers says it was "in a matter of months".] Hmm, I'm going to guess a year, but I'm not positive. I remember "discovering" the TRW chip when we were located in a temporary building, but the main development of the Speech Analysis module occurred in the North building of the Central Expressway site. I'll guess one year from the start to shipping the first PASS unit. I've heard that TI might have made at least two versions of the Speech Analysis module - the first using bipolar multiplier/accumulator ICs (by TRW), and a later version using their TMS32010 DSPs. Do you have any information about that? Hah! Yes, I'd believe it. I don't recall getting any details on the DSP version, but it makes sense that would have been done if the need existed long enough. What made it for you "one of the most fantastically interesting projects I ever designed/built during my career"? All of the above. A real need, a chance to design it (the speech analysis board and integrating it with the other hardware), build the prototypes, and put it into an initial limited production of 100 units. Then to travel to and transfer the technology to the TI group in the UK. Pretty much a complete lifecycle for a development system. Approx how many PASS systems were sold? I know we were building 100 units (at least I'm pretty sure about that…) You hopefully understand that there were other means TI continued to use for developing the LPC speech ... professional speakers brought into sound booths with high quality digitizers and VAX computers used. The PASS system was intended to be a quick-turn method for sales, demonstrations and by customers who just wanted to experiment. It sounds as if TI considered that LPC speech had a significant market and future. What sort of resources where they pushing at it? Special recording facilities, top notch audio/engineering talent in the R&D and CEC groups. Who were TI's competitors for speech systems? How did they shape up compared to TI's offerings? Pretty much all semiconductor companies had some form. LPC was initially good for the very low memory requirements, but as memory got more expensive, well, other forms of more "intelligible" compression eventually won out. Apparently recorded LPC speech required considerable tweaking to make it really good. What support did TI provide for learning to edit LPC speech? In the CEC we had several (3 or 4) people who got real good at it. One of them (barely visible) is sitting next to me in one of the photographs. I'm embarrassed I don't remember her name. As far as support, learning how to edit the LPC data, well, I don't remember anything other than a LOT of goofing around with the data until it sounded right. Other than adjusting amplitude, not the easiest thing to manipulate after the recording was done. TMS 5220 Voice Synthesis Data Manual. Leading Electronics Press Coverage of Speech Synthesis Products and Technology from Texas Instruments. IEEE Micro magazine, June 1987 edition. "A Personal Computer-based Speech Analysis and Synthesis System". Mentions the TI PASS system. Bristow, Geoff, "Electronic Speech Synthesis - Techniques, Technology and Applications", McGraw Hill, 1984. Pages 223-226, Section 13.5 (section written by Eugene Helms). Includes a description of the TI PASS system. Electronics magazine, September 8, 1982 edition, pages 151-156. "Portable speech development system creates linear predictive codes". Article about the TI PASS system. This article is reproduced in the "Theory of Operation" section. New Scientist magazine, 10 June 1982 edition. "Talking suitcase cuts the cost of speech synthesis". Article about the TI PASS system. Atari/Atari Games - Memos and Status Reports 1982, Jed Margolin. Various e-mails that cover (amongst other things) Atari's investigation into and evaluation of the TI PASS system. Classic 99 – The Official Newsletter of the Hoosier Users Group, Volume 18 Number 1 (January – February 1999), page 9. Brief specification of the TI PASS system, translated by Michael Zapf from the "Pocket Guide" Volume 3 published by Texas Instruments Germany. Design of the Texas Instruments Speak & Spell, including the idea behind the product, how it works, bugs, educational role, focus groups, product introduction, taking the product into production, and engineering notebooks. A dump of the EPROMs on the TM 990/101 and TM 990/201 modules is available here.